I was in the mood to bake bread. On a weeknight. On a night when I didn't get home from work until 7:30pm. The baking project probably wouldn't start until 8pm. So I wasn't feeling too adventurous; I mean, if the bread got challenging and had unexpected fancy technique involved, I might be up really late...on a work night. Enter: challah. Challah is something I can practically do in my sleep. So all that was left was choosing a challah recipe. 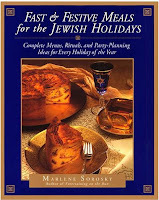 I decided on a challah from Marlene Sorosky's Jewish holidays cookbook. And I was inspired by a note she had at the end of the recipe for alternative flavors to traditional challah. I tweaked the orange date alternative she had listed there, and the same old tried and true plain jane loaf quickly became orange poppy seed challah! It just so happened I had orange juice and an orange in my fridge. The little flecks of orange peeking out of the shaped, risen, ready-to-bake dough got me excited. The aroma of baking bread combined with the citrus in this special version made my place smell amazing. Slicing through the cooled, baked bread, the orange flecks are still apparent. The taste is definitely citrusy, but not over the top in any way. The crumb is perfect, and I'd describe it as feathery rather than chewy or gummy bread. My mom had the brilliant idea to take slices of this orange poppy seed loaf and make french toast sandwiches with a layer of cream cheese and a layer of orange marmalade in between. The thought of that makes me salivate. To turn a conventional challah into something extra special, try this orange poppy seed version. It will be even better if you knead in a cup of chopped semi-sweet chocolate. I think I'll do that next time. To make the dough, in a small bowl, combine yeast, 1 teaspoon sugar, and warm water. Set aside for 5 minutes, or until foamy. In a large mixing bowl with beaters, mix 3 1/2 cups flour, salt, and 1 tablespoon sugar on low speed until combined. In a small bowl, whisk eggs until frothy and then measure out 1 tablespoon to place in a separate tiny bowl to reserve for the egg wash when it comes time to bake the challah. Add the egg (all but the 1 tablespoon reserved) to the flour mixture. Then add the foamy yeast mixture to the flour. Add the boiling water, orange juice, grated orange peel, and oil, and mix for a few minutes on medium-low speed. Scrape down sides of bowl. Switch to the dough hook and add flour, a tablespoon at a time, until the dough pulls away from the sides of the bowl and is smooth and elastic. You shouldn't need more than about a half a cup of flour for this. You can also do this by hand; just be sure the board and your hands are well-floured and try not to touch the dough with your fingers. Kneading in the mixer will take about 8 minutes but watch it closely because you don't want to overmix it thereby introducing too much gluten into the dough. Transfer the kneaded dough from the mixer onto the dough board and gently knead it for another minute so it forms a nice ball. Kneading by hand will take about 12 minutes. For the first rise, spray a large bowl with Pam, place dough inside so the bottom of the dough is greased, and then flip the dough so the other side is greased, too. Cover with a lightly dampened towel and place in a warm, draft-free place until double in bulk, 60 to 90 minutes. When you poke the dough with your finger, an imprint should remain. Punch dough down, remove to a lightly floured board, and knead until smooth and shiny, about 2 minutes. To shape into a long braid, divide dough into 3 pieces. With your hands, roll each piece into a long, smooth rope, about 20 inches long by 3/4 inch wide. Place on a greased baking sheet or silicone baking mat. To braid, bring left rope under center rope and lay it down. Bring right rope under new center rope and lay it down. Repeat to end. Pinch ends and tuck under to seal. If you want to finish the challah tomorrow, you can refrigerate the loaf overnight at this point. If chilled, the second rising will take at least twice as long. For second rising, let loaf rise at room temperature, covered, in a draft-free place until double in bulk; about 45 minutes if at room temperature, at least 1 1/2 hours if chilled overnight. To bake, preheat oven to 375 degrees F. Brush loaf with the 1 tablespoon beaten egg you had reserved (you can use a pastry brush or your finger) and sprinkle poppy seeds on top right away (the egg wash will dry quickly and then the seeds won't stick). Bake for 35-45 minutes, or until golden brown and bread sounds hollow when tapped. If crust starts to get dark before the bread is done baking, cover loosely with foil for remainder of baking time. With a giant spatula, remove from baking sheet and cool on wire rack. Cooled bread may be stored at room temperature, sealed in a plastic bag overnight, or frozen. Let cool completely, then slice and serve! Made challah once in college, and it was awesome. Ate the entire thing walking back to the dorm. A little orange makes it even better.